Dayamani Barla had made up her mind to fight elections soon after being released from jail. In the winter of 2012, the activist spent 69 days locked in a small cell in Birsa Munda jail in Ranchi. 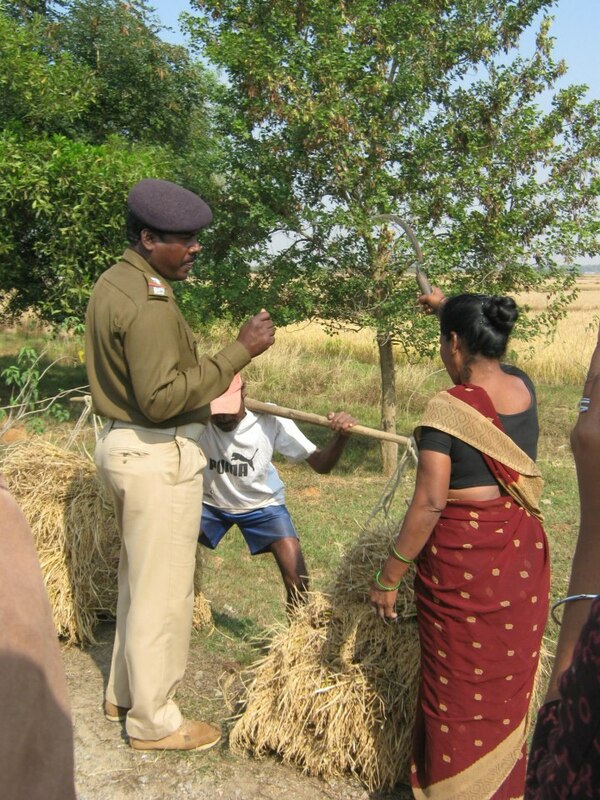 She was accused in a case relating to leading 400 Oraon tribal farmers in Nagri as they questioned why the campuses of elite institutes such as the IIM Ranchi, and a national law university be built on their fertile multi-crop farmland when there was ample barren land nearby. Nagri’s tribal women farmers carried fruits for Dayamani at every appearance she made at Ranchi courts as the arguments for bail went on. She recounts being able to see only a patch of the sky from her tiny cell’s window. Her sister-in-law passed away while she was in jail. “When I came out I felt vulnerable. I needed a formal alliance to back me in this work. Market forces put a price on every human being and institution, and many are drawn to individualism. But there is still a collective spirit in villages here, even if there is a vacuum in leadership,” she says. It is this void the 48-year old believes she can fill if elected on an Aam Admi Party ticket from Khunti, from where BJP’s sitting MP Kariya Munda has been elected seven times. Before Nagri, she had led a movement against Koel Karo dam in Torpa in Khunti where she was born in a Munda tribal household. From 1995 onwards, Dayamani, then 29 and working as an independent journalist with Jan Haq Patrika, organized tribal villagers in their struggle against the dam that would displace over 53,000. The resistance continued despite eight villagers dying in police firing in 2000. She received death threats when she travelled across four districts in Jharkhand between 2006-2010, organizing villagers opposed to giving up their farmland for Arcelor Mittal’s steel plant over 11,000 acres. She led them citing the Chotanagpur Tenancy Act, enacted in 1908 after the Birsa movement, which prohibits sale of tribal land to non-tribals in this area. “Why should we settle for “compensation” when we should be co-owners?” she raised the question at the core of crushing disparities in mineral-rich Jharkhand, while addressing farmers in Bokaro who enforced an “economic blockade” against Electrosteel Casting Limited’s steel plant last September. The speech she gave at Bokaro resulted in a FIR against her. When not traveling in villages, Dayamani can be found in the tea-shop she runs with her husband Nelson near Ranchi’s Sujata Chowk to support her public work. Photographs of Jharkhandi intellectuals such as academic Dr Ram Dayal Munda, and photos she has taken of paddy fields, festivals in villages adorn the walls. Sometimes she uses this space for her work appointments, discussions too. Her full-throated laughter rings in the middle of conversations. “Dayamani does things at her own pace,” smiles her close friend film-maker Shri Prakash. “She is alert, sincere, and strong; she has achieved which few people could,” says Dr BP Keshri who retired as the Head of Ranchi University’s Tribal and Regional Languages Department. On an impulse Dayamani trails off to pick a jharoo – AAP’s election symbol – from the floor of a hut nearby before beginning her election speech in Ghorpenda village, or makes a piercing comment about how urban Ranchi perceives here, where the bureaucracy is dominated by the lighter-skinned. “When I go to government offices, sometimes peons ask rudely, what do you want, why are you here. There have been instances when I have waited outside offices for long and watched their reactions change when I say my name is Dayamani Barla and this is why I am here,” she says. There is a lot Dayamani’s childhood taught her to steel up against. She watched her parents lose their land when she was nine to a businessman, after signing on documents they could not read. While they began working as domestic servants in Ranchi, she and her brother studied in their village in Arhara feeding themselves. At 13, she too moved to Ranchi, living in a shed with cattle, cleaning utensils and eating leftovers working at the Ranchi police barracks. She cleaned utensils in a household till her employer tried to sexually assault her one day. “I was 15. I do not know from where I found the strength from to throw that man off and escape. I left the work at the family’s house, and supported myself learning typing in Hindi, English till I enrolled in M.Com. at Ranchi University,” recounts Dayamani. She briefly worked at a NGO but left it when she found the organization made little attempt to account for funds got for public purpose. She soon started contributing articles to the newspaper Prabhat Khabhar. In 1995 she had set up the tea-shop. Her livelihood assured, she immersed herself in the Koel Karo movement. “She know what it is to be poor, and the poor’s problems. She believes if you have been given buddhi, social consciousness, it is meant to be passed on,” says her childhood friend and husband Nelson. At Jabra village, Dayamani takes time to slowly build the conversation about her election campaign with the tribal villagers who have brought their own mats to sit on to listen to her speak. “What is it that we are fighting for? How should do we take this campaign forward” she asks the villagers and listens as the group slowly comes to consensus. By the end, more than 60 villagers gathered here have decide to contribute 2 kg rice and Rs 50 each to her campaign. 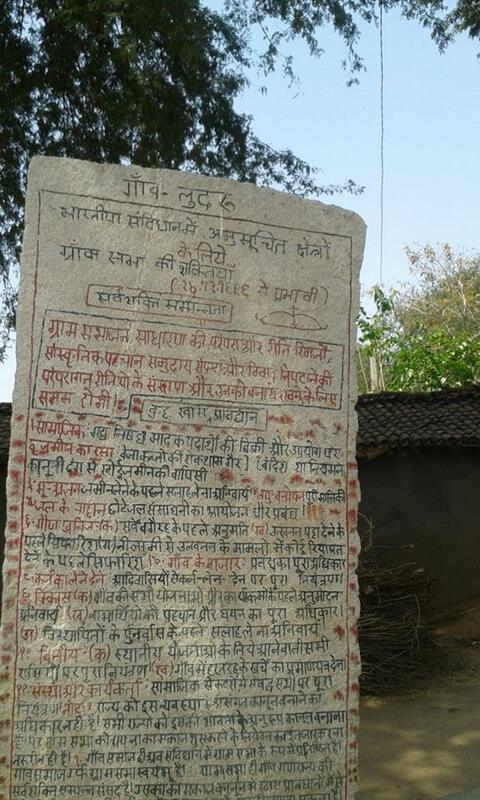 At Ludru, where villagers have erected a megalith to inscribe Panchayat Extension to Scheduled Areas (PESA) Act 1996 rules governing use of community resources in the village, she asks whether these norms are really effective, if the village has reached what its idea of poorna swaraj. “Sometimes I act radical with a reason, at other times I wonder if I am being firm or stubborn,” she muses on her way back to Ranchi, 40 km away. An edited version appeared in The Hindu. On the morning of November 20 Nandi Kashap and Parveen Toppo woke up at five am, an hour earlier than usual. By seven, both women were in the village akhada (square) to join a group of 20 gathered there. For two days Rapid Action Force (RAF) constables stationed in their village – two companies numbering 150 – had turned them away each time they tried to harvest the paddy they planted in August. “We will have to go to each others plots and harvest this together in big groups. Let us see how they stop us,” the group concluded. In 2010, the Jharkhand government allotted 227 acres of land to build campuses of Indian Institute of Management (IIM) Ranchi, National University of Study & Research in Law (NUSRL) and the Indian Institute of Information Technology (IIIT) in Nagri village 15 kms from Ranchi. But Nagri farmers, more than 400 Oraon adivasi families, have refused to move away from the farmland they have cultivated since generations. 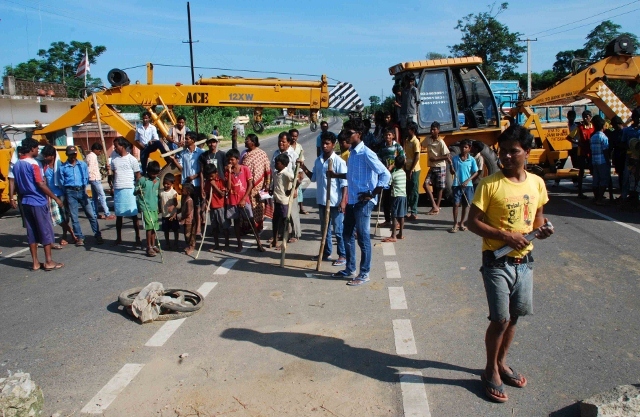 Responding to their defiance, the Jharkhand government has imposed Section 144 IPC in Nagri thrice since July prohibiting farmers from gathering on the farmland, and stationed paramilitary forces in the village. Earlier in January the government bulldozed their winter crop of wheat and potato. The government claims it already acquired the land to build an extension and a seed farm for Birsa Agricultural University in 1957-58. But Nagri’s farmers led by adivasi activist and journalist Dayamani Barla contest this citing documents obtained by Ms. Barla through Right to Information applications that show that of the 153 families to whom the Government had offered compensation in 1957, only 25 had taken it. The rest had refused. Nagri’s farmers possess proof of having paid taxes on this farmland till 2007 and even 2011. Why not the government not set up campuses on non-agricultural land instead, they ask. Further, they question if it is legal for the government to have acquired the land under clause 17(4) of the Land Acquisition Act meant for situations of urgent public requirement and not putting it to any use for 55 years. With the state government floundering in providing a solution either to the farmers or to the institutions like NUSRL and IIM which are operating from ad-hoc campuses at present, the Jharkhand High Court has been goading the state government into action to secure the three colleges’ campuses in this tribal village on the outskirts of Ranchi. In April, Nagri farmers began a 150-day peaceful protest on their farms. On April 30, favouring a PIL filed by the Bar Association of Ranchi the HC ordered the government to “to secure the construction of the buildings of the educational institutions within 48 hours.” Three farmers – Mundri Oraon, Dashmi Kirketta, and Poko Tirke – died of heatstroke while sitting on protest in the fields in the blistering May sun. When the HC dismissed Nagri farmers’ application to review government’s 1957 land acquisition claim, they approached the Supreme Court. But SC declined to hear their special leave petition saying that in this matter of land acquisition of 1956-57, it was not inclined to interfere in the HC’s orders. “There is no such unit as “gram per person per day” for measuring soil fertility. 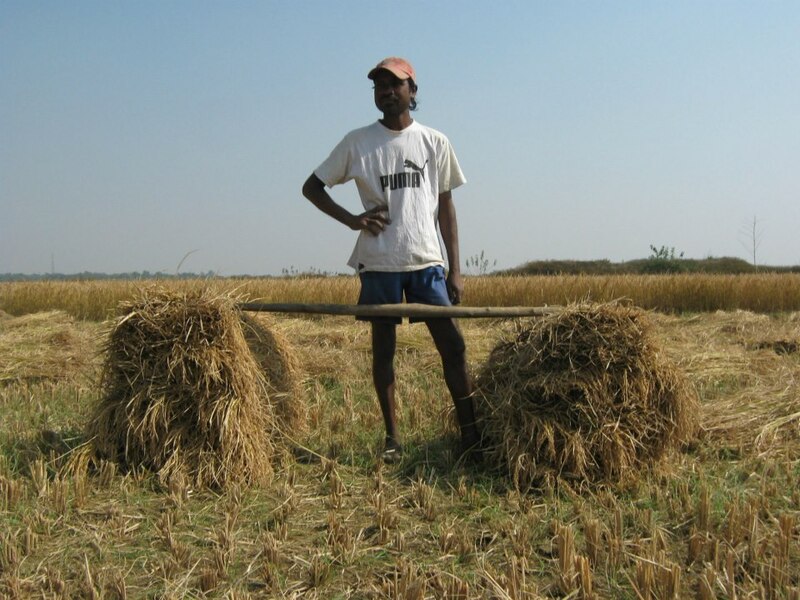 Only 15 percent of land in Jharkhand supports more than one crop and Nagri village is one such area. Because it lies by Jumar river, farmers grow hybrid paddy, wheat, gram, and even vegetables,” said a senior scientist in the Agricultural Extension department of Birsa Agricultural University declining to be named. 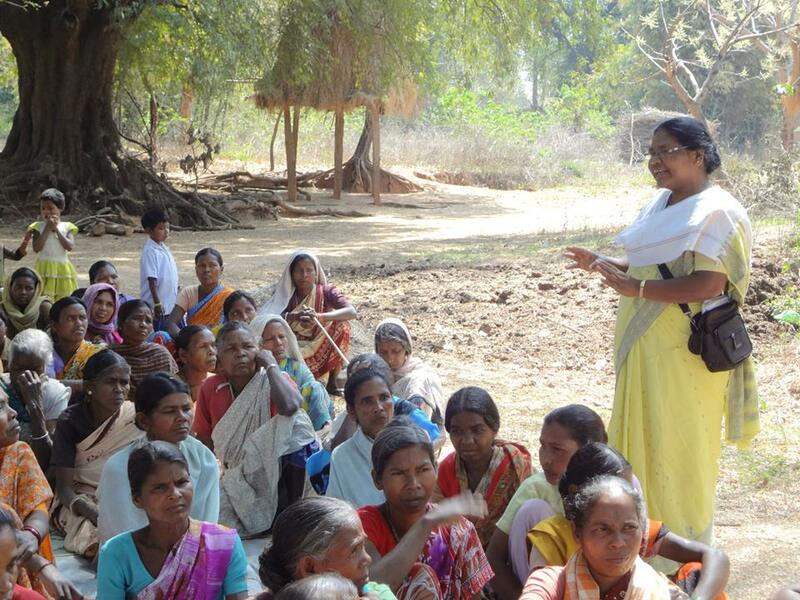 Two weeks later, on September 26 , the Chief Judicial Magistrate (CJM)’s court in Ranchi issued a property warrant against the movement’s leader Ms. Dayamani Barla for leading a demonstration for MNREGA cards in 2006 at the block officer’s office in Angada, Ranchi. She surrendered at the CJM court on October 16 and got bail two days later. But before she could leave the prison, she was charged in a second case – for ploughing the plot of land in Nagri where NUSRL and IIM had already constructed boundary walls costing Rs 2.25 crores and Rs 1.7 crores respectively. “A group of 100-150 farmers from Nagri led by Dayamani Barla entered the plot where NUSRL and IIM had constructed boundary walls and cultivated the land. We told them not to but it had no effect on them,” reads the August 15 FIR. The FIR does not mention any use of force by villagers or by Ms. Barla but a case has been registered against her under IPC Sec 353 – assault or criminal force to deter public servant from discharge of duty – a non-bailable offence. While CJM court had rejected Ms. Barla’s application three weeks back, on November 24 the district court rejected it too. 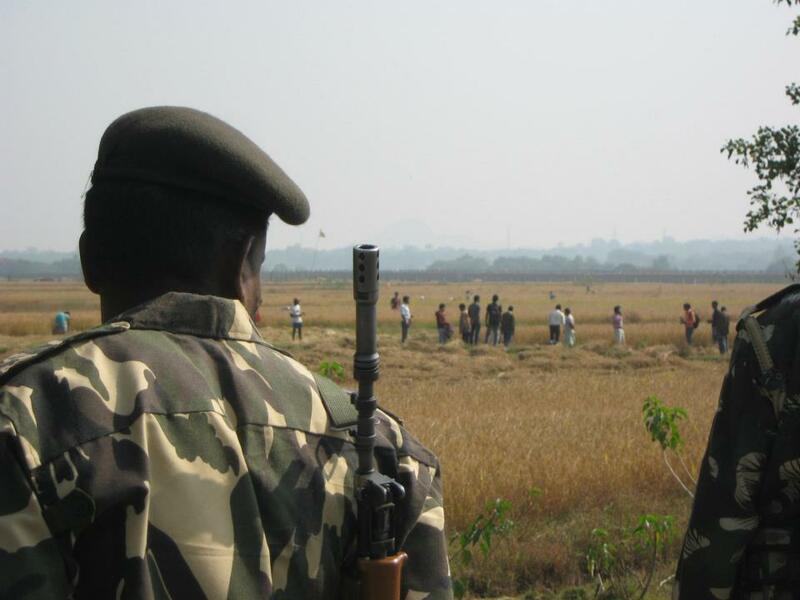 On Wednesday, as Nagri’s adivasi women reaped a defiant harvest, the area’s district magistrate stationed at the site and RAF constables wielding INSAS rifles and teargas boxes looked on expressing their sympathy and helplessness. “The government has no concern for either us, or them. Dew soaks through our tents every morning, the women constables have no access to toilets,” said a RAF constable. “It is these farmers’ labour and their money invested in this land. If these students can go abroad to study, why can they not travel a few kms further away for their building?” said another. Staff at IIM Ranchi which has been allotted 72 acres at Nagri say they prefer to consider an alternate location. “Farmers are the backbone of our economy, we cannot disregard them. There seems to be a lot of confusion over who is the owner of this land. We are considering an alternate plot of land in Namkum,” said Director IIM Ranchi Prof MJ Xavier. NUSRL has been allotted 63.76 acres at Nagri. “At present we have five classrooms and two rooms for other work at our rented campus at BIT Mesra. For the 2013 batch, we will have no classrooms. We are merely following government orders on this issue” said NUSRL’s Dean A K Gupta, refusing to comment on the soil fertility data submitted by NUSRL students to the court. At Nagri, each instance of the situation having reached a boil in the last two years seems to have only intensified the farmers’ agitation. “We will reap this harvest and plough the land again to sow gram and mustard. If the government tries to stop us, they should prepare for our response too,” said Vikas Toppo (35) who has emerged as the one of the main leaders in the Nagri Bachao Samiti. “There are five-six families who are willing to act like dalals (middlemen) of the government or even the real estate companies but the village does not support them,” says Toppo against whom the police has registered three cases in the course of the agitation. Toppo says he studied zoology for two years in Ranchi University but graduated in arts. He recalls he spent some months in Delhi preparing for the civil services exam. “Ten years back when I was visiting my village, I got involved in a case my neighbour was fighting against a real estate company trying to build a pathway through his land,” he recalls. He did not go back to studying after that. This report appeared today in The Hindu. All photos are by Deepu Sebastian Edmond, my friend and Jharkhand correspondent for The Indian Express.